Home consumer Cooperative extension farm farm business food food business grocery Marketing penn state Is Smartphone Usage Hurting Retailer Sales? Is Smartphone Usage Hurting Retailer Sales? For those who own smartphones, you know how easily you can use one to compare prices. This practice, known as "showrooming", is great for customers' wallets, but hurting sales at brick and mortar stores. A store in Australia specializing in gluten-free items has taken a rather extreme measure to prevent showrooming. The store is charging anyone who comes in the store a $5 "just browsing" fee, which is returned if the customer buys something. Charging customers a fee to look around your store is definitely an extreme measure to prevent showrooming. You can expect this to anger potential customers, so I would not suggest going such an extreme route. But what can you do to curb showrooming? First, it's important to understand why consumers are using their phones. In a survey conducted by Perception Research Services International, 53% of consumers use their smartphones to compare prices, read customer reviews (49%), check for sales/coupons (48%), and searching for product information (48%). Consumers want to know they're getting a good product at a fair price. For example, Target monitors competitors' prices on 30,000 products to be competitive. They also recently introduced a policy that will match online competitor pricing. 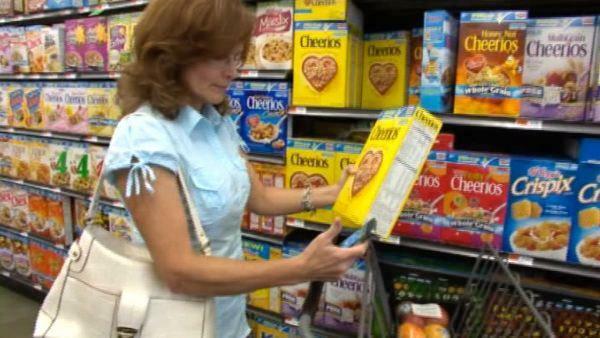 Grocery customer using a smartphone to compare prices. As a food retailer, do you see a lot of customers using their smartphones while shopping? Do you actively compare your prices with online retailers to stay competitive? Do you offer a price matching policy?